Here is a summary of our delivery costs. If anything is unclear please do not hesitate to contact us and we will be happy to help you. Free – Available for Solid Timber Worktops and Brochures only. Worktops will usually be delivered the next working day direct from the manufacture if orders are received before 12pm and provided the goods are in stock. Brochures may take longer. Courier (7 – 10 working days) - £19.99 + Vat - Available on Handles and some Accessories ONLY. Duration of delivery is usually between 5 to 7 working days provided goods are in stock. 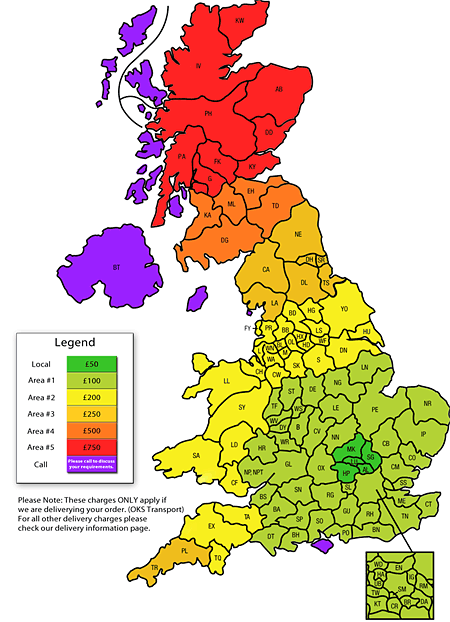 OKS Transport £50 to £750 + Vat dependent on postal code (detailed below on the postcode map). Automatically selected when you buy any kitchen units from us. Collect from Factory to arrange collection from our factory by either your own transport or perhaps your own courier. We will contact you directly to arrange a convenient time for your delivery or collection. Please note when collecting from us that our factory opening hours are 8am to 4:00pm Monday to Thursday and 8am to 12pm Fridays. We are not open on weekends. All deliveries for cabinets and appliances will be made by our own transport unless otherwise arranged with us. You may also choose to pick up your order yourself or arrange your own courier. To do this simply select Collect from Factory in the Select Delivery drop-down. We will always contact you to arrange a convenient time for your delivery or collection. Please ensure that provisions are in place to help unload bulky and heavy items including kitchen cabinets as our deliveries are only accompanied by one driver. We usually only deliver to a ground floor room. So if the delivery address is anything other than a straightforward house with immediate access (e.g. a 10th floor flat) then please contact our office to arrange the details as some units may have to be sent flat-pack or a drivers mate may have to be arranged for an additional cost. Please ensure there is adequate access for our large panel van and that it can be parked adjacent to the property. If our delivery cannot be made due to any of the aforementioned or there is simply no one at the address to accept delivery then the kitchen will be returned to the factory where upon we will contact you to reschedule a delivery. Should this occur you will be charged an additional delivery cost. For further information please check our FAQ page. All other deliveries will be made by courier unless otherwise stated. If any item is out of stock we will contact you and advise you of the situation, alternatively you can always contact us first and we can check the stock and advise you before you buy. In all instances the shopping cart will select the correct delivery cost for you, especially if you are a registered customer and logged in. Just add an item to your shopping basket and select View Basket and any delivery charges will be shown at the bottom, there are no hidden extras.